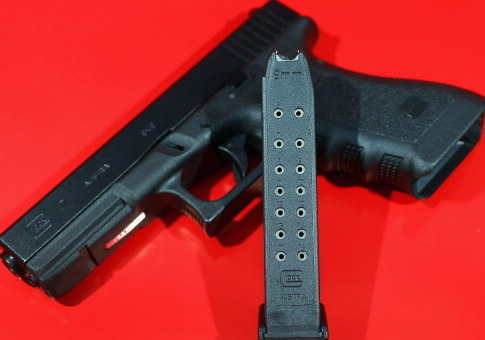 Nearly all modern full-size or compact handguns and rifles sold in the United States come standard with magazines capable of holding more than 10 rounds of ammunition. State police told the Washington Free Beacon the effort to enforce the law will be a statewide endeavor directed by the attorney general's office. They would not comment other than to say they will enforce New Jersey's laws. "We will enforce the law of the state," Lieutenant Theodore Schafer of the New Jersey State Police said. "That's our plan." Schafer would not give any details on the agency's plan to enforce the law and referred the Free Beacon to the attorney general's office for further questions. Leland Moore, a public information officer for the New Jersey Office of the Attorney General, refused to answer any questions on how the state planned to deal with gun owners who did not comply with the new law. He would not say if the attorney general has any guidance at all for those who currently own the magazines being targeted, which gun-rights activists have estimated to be up to a million New Jersey residents, or provide any insight about how the state will deal with those who don’t turn in, modify, or destroy their magazines. "We have no comment," Moore said to multiple inquiries. When pressed about whether everyone in possession of such magazines would be arrested and prosecuted, he refused to comment. When asked if officers might be sent "door to door" as some critics fear about such confiscation efforts, he refused to comment. "We've answered your query," Moore said. "We have no comment." The law does not appear to provide any funding or direction for any sort of additional enforcement efforts beyond normal police activity. There have been no reports of additional mobilization of police forces or any instructions to patrol for the magazines in question. Still, the attorney general's office would not say what tactics or efforts would be used in carrying out the law. In a 2-1 vote, the 3rd Circuit ruled the magazine confiscation law could go into effect because it does not violate either the Second, Fifth, or 14th Amendment as plaintiffs had claimed. Judge Patty Shwartz, an Obama appointee, wrote for the majority that the law serves a legitimate public safety purpose. "Today we address whether one of New Jersey's responses to the rise in active and mass shooting incidents in the United States—a law that limits the amount of ammunition that may be held in a single firearm magazine to no more than ten rounds—violates the Second Amendment, the Fifth Amendment's Takings Clause, and the Fourteenth Amendment's Equal Protection Clause," she wrote. "We conclude that it does not. New Jersey's law reasonably fits the State's interest in public safety and does not unconstitutionally burden the Second Amendment's right to self-defense in the home. The law also does not violate the Fifth Amendment's Takings Clause because it does not require gun owners to surrender their magazines but instead allows them to retain modified magazines or register firearms that have magazines that cannot be modified. Finally, because retired law enforcement officers have training and experience that makes them different from ordinary citizens, the law's exemption that permits them to possess magazines that can hold more than ten rounds does not violate the Fourteenth Amendment's Equal Protection Clause." Judge Stephanos Bibas, a Trump appointee, dissented by saying the state did not meet the burden of proving they haven't violated the Second Amendment. "The Second Amendment is an equal part of the Bill of Rights," he wrote. "And the Supreme Court has repeatedly told us not to treat it differently. So, we must apply strict scrutiny to protect people's core right to defend themselves and their families in their homes. That means holding the government to a demanding burden of proof. Here, the government has offered no concrete evidence that magazine restrictions have saved or will save potential victims. Nor has it made any showing of tailoring." Gurbir Grewal, New Jersey's attorney general, tweeted on Thursday that the decision is a "big win for public safety and law enforcement safety" and upheld "a sensible law to address mass shootings." The case, however, may not be settled. The Association of New Jersey Rifle and Pistol Clubs promised on Thursday to appeal the decision. "This decision is plainly wrong and upholds New Jersey's unconstitutional law turning one million honest citizens into felons for keeping property obtained legally that could be used for defending their lives," Scott Bach, head of the gun-rights group, told the Hill. "The decision will be further appealed." This entry was posted in Issues and tagged Gun Control, New Jersey. Bookmark the permalink.